I'd like to take credit for this, the 100th episode of Faron Square. Oh, sure, someone else actually thought it all up, and wrote it, and drew it. Even lettered it and colored it all up. But a couple of strips ago, I suggested it in the comments. You're welcome! Congratulations, Bruce. Now you have to start thinking about what the book collection is going to look like... get that Kickstarter campaign underway! 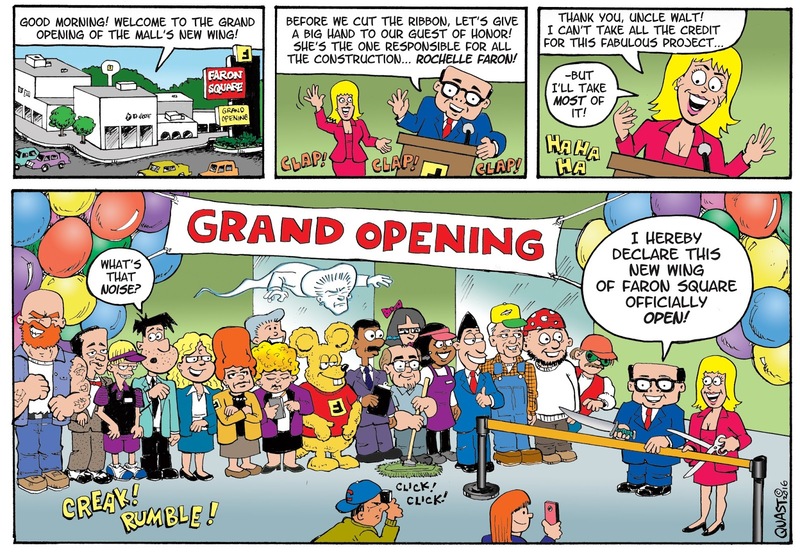 Yes, the new wing of Faron Square is open … for disaster! Woo hoo! 1) It appears I used an inaccurate measuring stick; this is actually the 99th strip after all, and not #100. Sorry! But hey, I got to reread the entire series all through to find that out, so that wasn't a bad thing. 2) Merle and the shoplifter are both in the crowd - and so is Fredo! We have yet ANOTHER inhabitant of the Rat suit! I like the way you pay attention to the details on the pictures. There is a crowd on the fourth picture: all the people are so different! If you want to write an paper about your process of comix creation, I would advise you the service paper writer.